Oh, to have been a fly on the wall in Vienna at the end of November, at the most recent OPEC meeting, when Russia’s Igor Sechin—the chief executive of Rosneft (Russia’s largest oil producer), former KGB apparatchik and all-around best crony of President Vladimir Putin—met with Saudi Arabia’s oil minister Ali al-Naimi. Neither, officially, is a minister of war. They were there to talk about oil. But oil, make no mistake, is a weapon for both nations, and one was about to use it. At the time, benchmark crude oil prices stood at around $80 per barrel, well down from the $100-plus price that had prevailed for several years. “Reversing the rapid fall in price is the focus for oil ministers this week,” wrote one Canadian journalist. Though much of the world’s financial press still treats OPEC as an economic organization of consequence—a cartel that “sets prices” through its collective decisions on output—it is not and has not been for decades. Economically speaking, in times of oversupply or undersupply, there is only one country on Earth whose decision on output, and therefore price levels, matters: the Kingdom of Saudi Arabia. It can produce more oil on a daily basis than any other country, and it can do so at the lowest cost per barrel by far. Think of it this way: Saudi Arabia, if it so chooses, can challenge any other oil-producing nation in the world to a contest to see who can dunk its head underwater and hold its breath the longest. It can do so because it knows its lung capacity is far superior to anyone else’s. Therefore, as Sechin well knew, the only thing that mattered in Vienna was what the Saudis were going to do. And when he left Austria, he could not have been a happy man. In the weeks since, global oil prices have cratered. On December 11 they slipped below $60 per barrel, and the Saudis have given no indication of reducing production to stop the slide, despite flagging demand for crude, particularly in developing countries like China, whose appetite steadily drove prices higher in the first decade of this century. Furthermore, there is no sign that the rout will abate anytime soon. And because of this, Russia is now enduring an economic whirlwind. The country derives 68 percent of its export revenue from oil and gas sales, and energy accounts for about half of Moscow’s budget revenue. Not surprisingly, the country’s currency, the ruble, is crashing, down nearly 50 percent so far this year. On Monday, the ruble tumbled around 10 percent against the dollar, and the Central Bank responded by raising a key interest rate to 17 percent from 10.5 percent. An economy that was already stagnating—growth was just 0.8 percent in the first half of this year—is now almost certainly contracting. Consider that the World Bank in October noted that the country needed to “internalize several rounds of sanctions and counter-sanctions” (due to Russia’s annexation of Crimea and invasion of eastern Ukraine). Because of this, the best Russia could hope for was close to no growth for the next two years. Nowhere mentioned in the World Bank’s report was the possibility of an outright crash in oil prices—the one that we are now in the midst of. Moscow, to be sure, has come a long way since the chaos of the late ’90s. Fiscal reform in the early part of this century under Putin and Dmitry Medvedev, his prime minister, established a “rainy day” fund, which now stands at $91.7 billion. Moscow has acknowledged it may need to tap into the fund to meet its budget obligations in 2015. 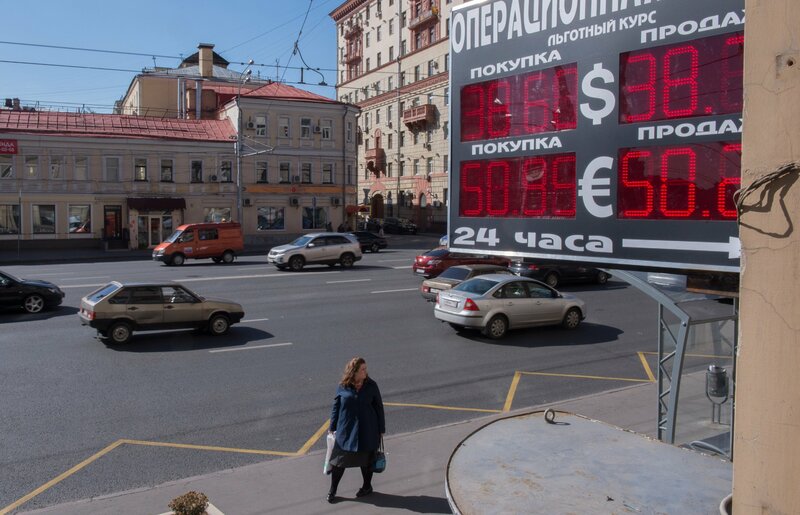 Russia’s cheerleaders—the few who are left—note that since the ruble’s decline has so far outpaced the fall in energy prices, the country’s ability to service its domestic obligations has not yet been affected. (The payments it makes at home are, obviously, in rubles, but it takes in dollars for every barrel of oil or cubic foot of natural gas sold abroad. Even with fewer dollars, it can buy just as many rubles.) But that’s a bit like a pilot who’s had his engines fail telling his passengers not to worry because he’s doing a great job conserving fuel. If the ruble’s fall is of little concern, then why has Russia’s central bank intervened (fruitlessly to date) five times this year to prop it up? What must concentrate minds in Moscow (and oil capitals across the world) these days is the fact that when oil prices move, they tend to move violently. In economic parlance, they “overshoot”—both on the way down and on the way up. Anyone care to guess what the crude price was in 1998, in the midst of the Asian financial crisis? As the folks in Moscow know all too well, it hit a low of $10 per barrel. As for where it’s going now, the answer is clearly lower, but how low? That’s no doubt part of what Sechin was trying to get out of al-Naimi at November’s OPEC meeting. Russia’s average cost of oil production, according to London-based consulting firm Energy Aspects, is a shade over $40 per barrel, slightly under the global average of $50. (Saudi Arabia’s, by contrast, is just over $20 per barrel.) Russia’s oil industry, in other words, is still profitable, but the boys in the Kremlin and their allies throughout the Russian industry are staring at their screens every day now, and they are getting nervous. In Riyadh, the Saudis publicly say that the price of oil is a simple matter of economics and insist that there is no political agenda being pursued. But they don’t believe that in Moscow—and neither should anyone else. The Saudis are inflicting significant pain on two countries in particular: Iran, its mortal enemy in the Gulf and the world’s fifth largest oil producer, and Russia, Iran’s ally and a steadfast supporter (along with Tehran) of Syria’s Bashar Assad, whom the Saudis loathe and wish to be gone. The price Moscow is paying is evident in the economic pain now mounting throughout the country, and that pain is likely to get worse. A very serious game is afoot. How long can Riyadh push prices lower without eliciting some kind of response from the Kremlin and/or Tehran? If (when?) that response comes, it may not be in the form of a stern diplomatic note of displeasure. Tehran is the biggest state sponsor of terror in the world, according to the U.S. State Department, and in 2011 the United States disrupted an Iranian plot to blow up the Saudi ambassador to Washington. Putin doesn’t brook opposition well, at home or abroad. And Mideast intelligence officials believe Riyadh looks the other way as private Saudi citizens help fund ISIS’s war in Iraq and Syria (something the Saudis officially deny) while Tehran funds and advises the Shiite militias fighting ISIS. And oil is now very much part of a highly combustible mix. During its most important shopping season of the year, the U.S. is now understandably focused on the economic benefits lower oil prices bring. They may yet bring much more than that.